Yesterday’s news that the United States and Cuba announced to normalise diplomatic relations made me look back on our recent trip to Havana. Like many others, I wonder how this new chapter in history will change the island’s standard of living. I started this post while hubby was busy in the kitchen making dinner, I don’t enjoy cooking, and this makes him my perfect spouse. While at home I have nothing to do with our family’s cookery and nourishment, however, on the road I enjoy exploring food markets, finding quirky restaurants, and learning about the food culture of a country. In Havana, it was no different. 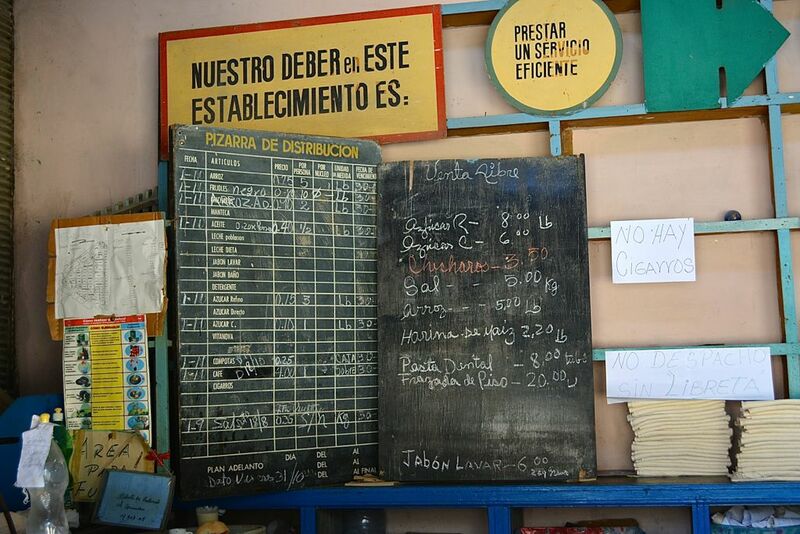 On our first day in the city, we observed the Cubans use of the libreta (family ration book), a per person monthly allowance dictating how many foodstuffs they can purchase. 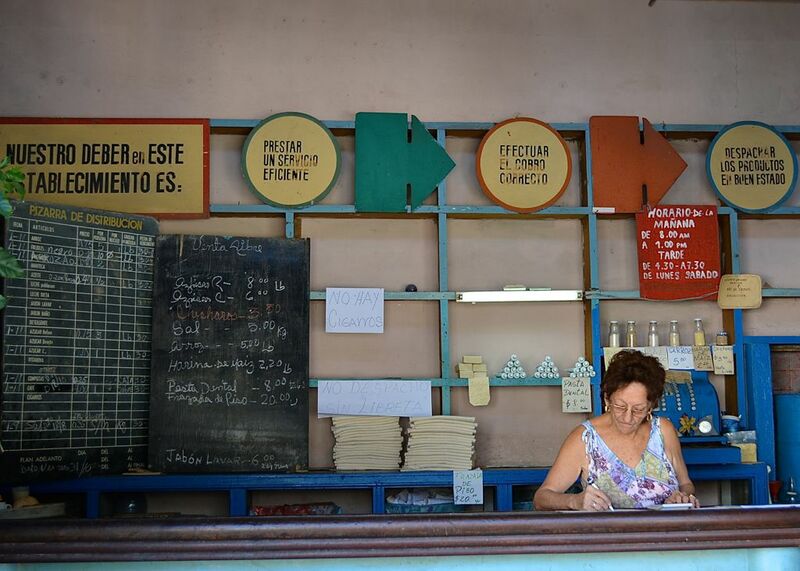 At neighbourhood bodega stores, they use the ration book to buy staples like rice, beans, cooking oil, eggs, and sugar, as well as matches, toothpaste, soap and other household goods. With my simple cooking skills and the limited basic ingredients, Gordon tells me I could prepare bland meals here too. Feeding a family is difficult and for many Cubans, trading and bartering become a way of life to make ends meet. Ration boards. Products and prices marked in the national pesos. A neighbourhood bodega woefully empty. 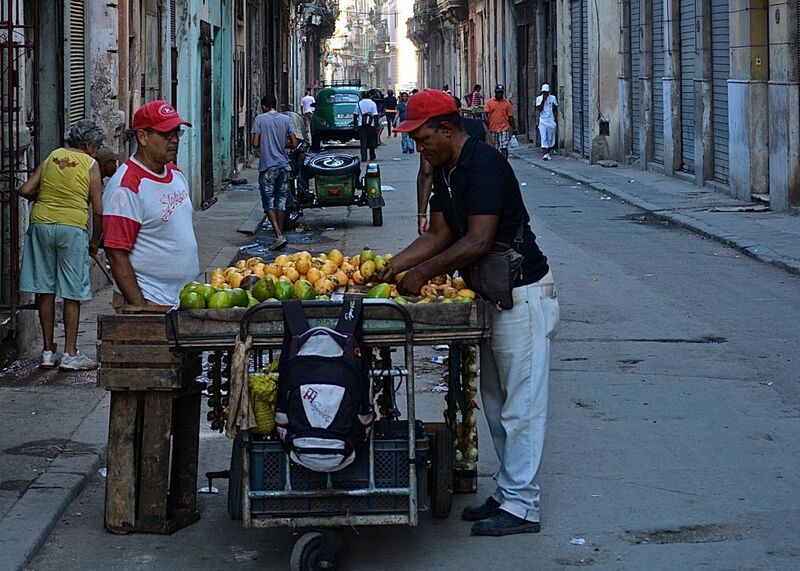 Cuba has been rationing food since 1962. Today, the government intends to eliminate the ration books. Thanks to these new reforms and others introduced in recent years, the country’s economic landscape is slowly changing. 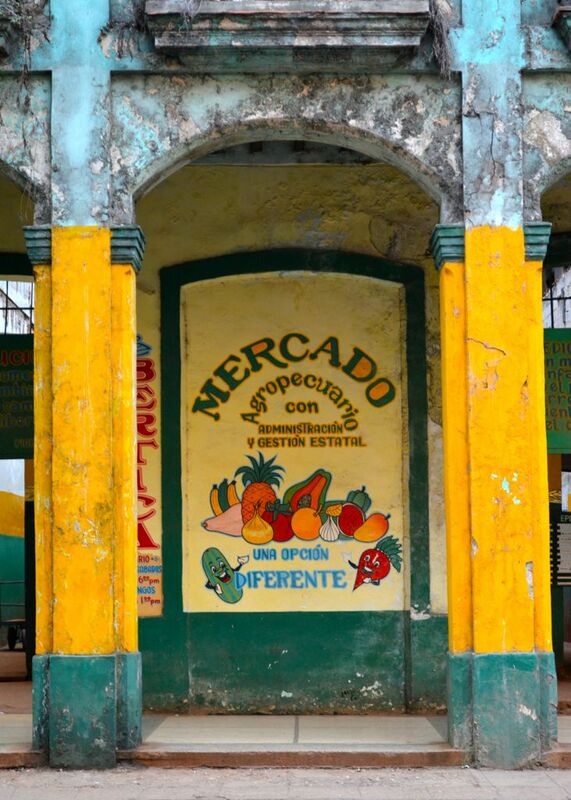 As we walked the city streets, we came across many ‘Mercado libre‘ (open markets), signs of the changing economic system. 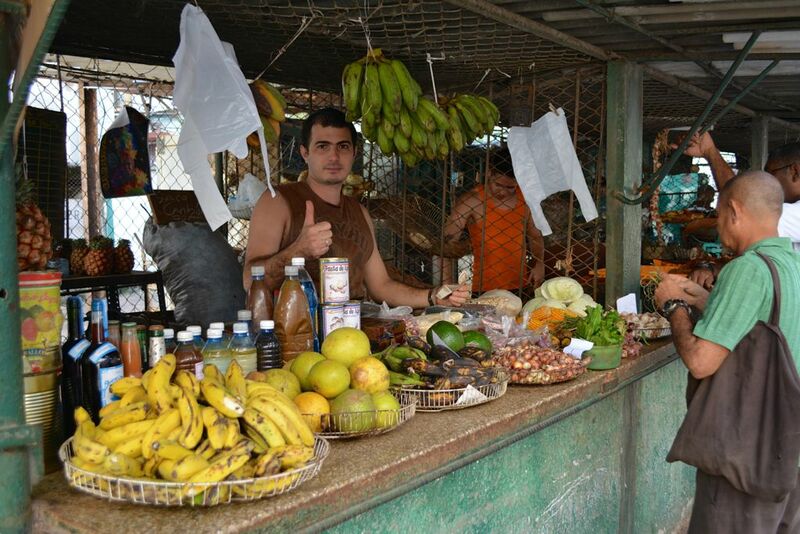 In these markets, goods can be purchased by Cubans with higher earnings, such as those working in the tourism industry, the self-employed, successful artists or musicians (including con artists), and others with access to foreign money (sent from friends or family living abroad). These markets offer a larger selection than food ration stores, but the selection is still limited and quite expensive relative to the typical meagre monthly wages. We saw an assortment of plantain, bananas, green oranges, small onions, and a variety of root vegetables unknown to me. A market vendor with a small varied selection. Next time I’m at the grocery store (that might be a while – hubby does the groceries) I’ll be sure to appreciate the variety of fresh fruits and vegetables available, bruise and blemish free. You can spot small signs of capitalism in the streets; Home windows converted into snack stands sell everything from juice to pizzas and the prevalent Cubano, a rather tasteless ham and cheese sandwich. A common sight, the Peso stall – this one selling pizzas. 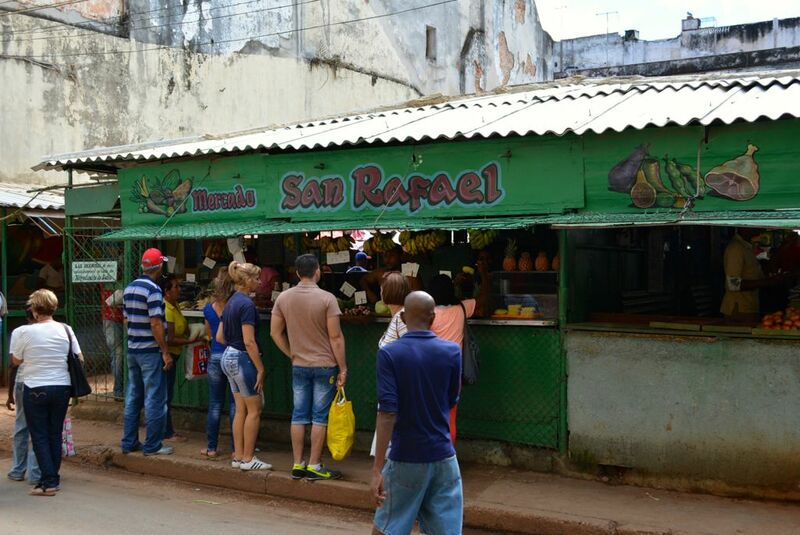 On every corner, you’ll find food carts selling green oranges or bananas for small change. You’ll rarely come across waste here. For example, the freshly squeezed orange juice bought through a small shop window is served in reusable glass cups. Street vendors and their fruit carts where you can get oranges peeled for you on the spot. Though back in Canada I repeatedly hear that “the food’s not very good in Cuba,” — it’s all relative. In a country where rice and beans are the dietary staples, you shouldn’t expect gourmet food. 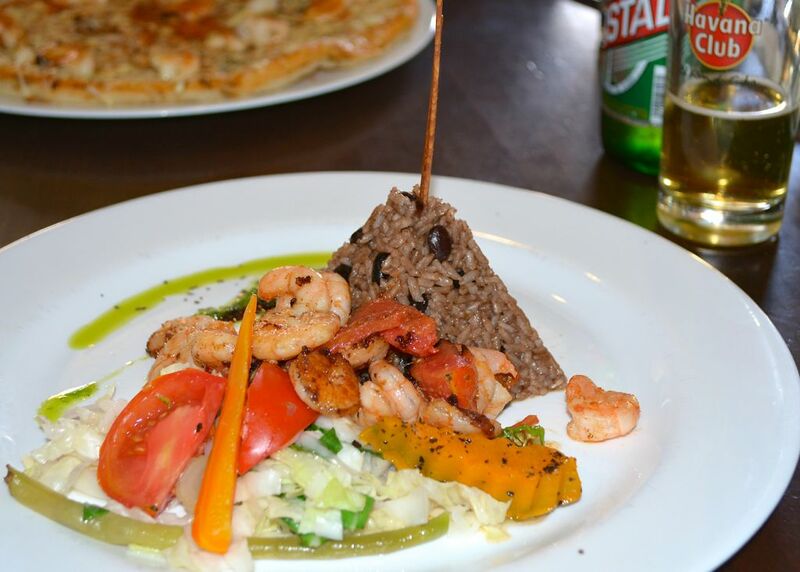 Instead, immerse yourself in the local way of life and experience Cuban cuisine. Despite this, tourists have many food options. Fancier state-run hotels and restaurants cater to international standards. 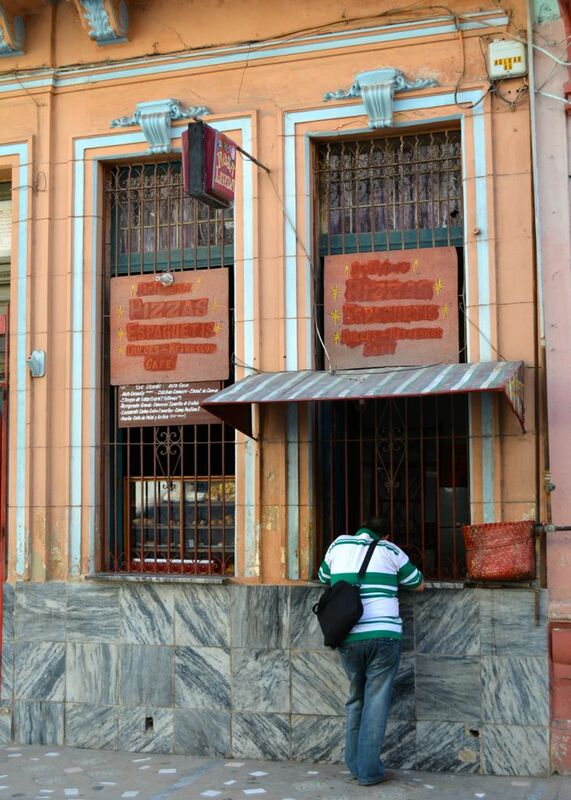 Privately owned food establishments known as Paladares are often run out of people’s homes. Food stands and carts round out your choices. 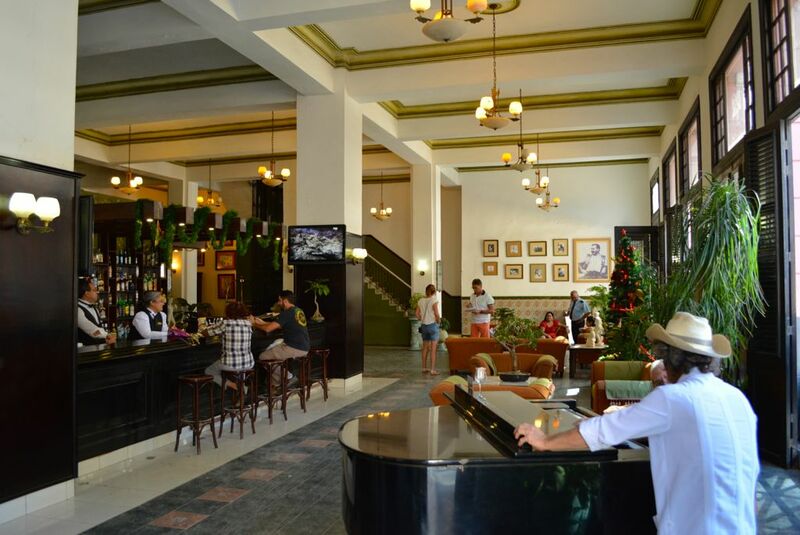 The lobby at Hotel Ambos Mundos. The rooftop restaurant offers a panoramic view of Hemingway’s Havana. I like ambience and people watching, while Gordon goes for the quality of food — in Havana we experienced both. 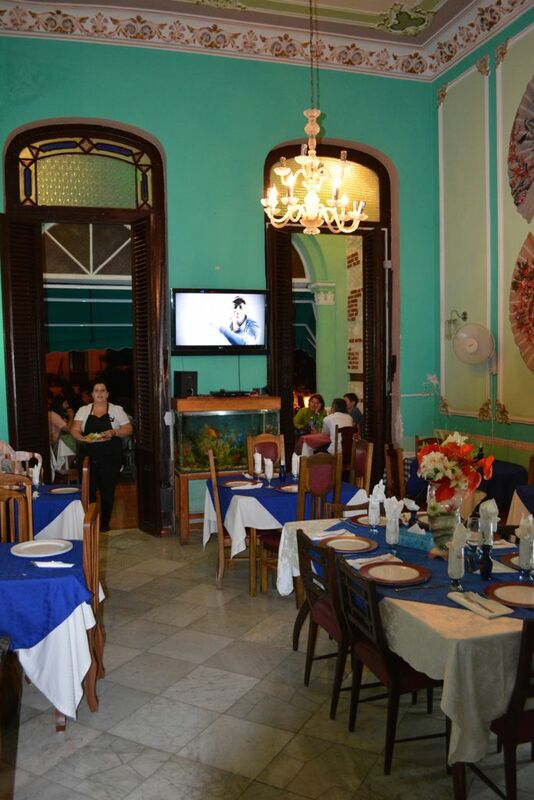 The website Cuba Absolutely offers restaurant reviews for those who prefer to plan ahead. However, we didn’t seek out any place to eat in particular and selected as we came upon them. We enjoyed all of our meals outdoors; at busy cafés, in beautifully restored courtyards or on balconies with views of the city, all the while sipping chilled local beers Bucaneros and Crystal. 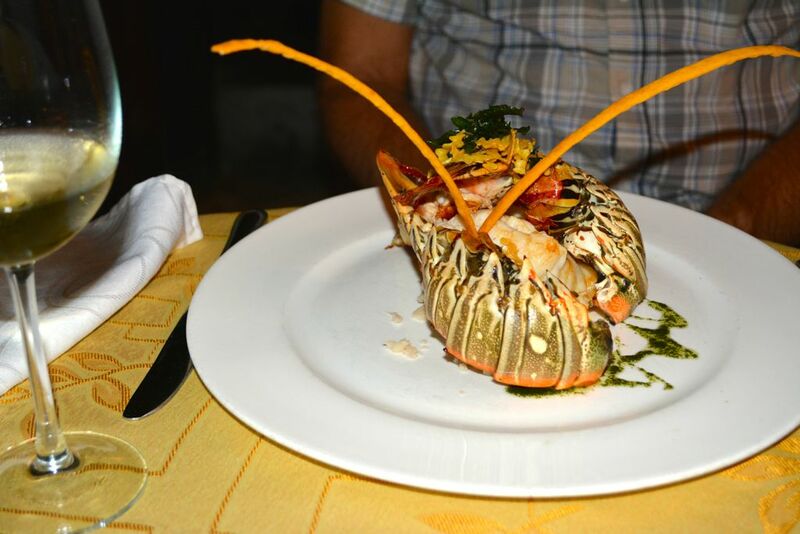 At Gourmet Havana, which specialises in Cuban cuisine, Gordon ordered a lobster meal and was pleased with the two huge lobster tails placed in front of him. In the same building, the rooftop patio offers great grilled food which can be enjoyed overlooking the city. Our only regret was an overpriced meal at the themed restaurant El Guarjirito. This review on trip advisor: “Hard to describe this place, Cuban version of Hooters probably best does it. Food not very good, lighting poor, waitresses with hardly any clothes on and no social skills at all.” is an accurate description. Paladar Doña Blanquita offered excellent homemade Cuban food, personal service (even the 10-year-old nephew was helping out) and a great location on the Prado. This looks to be the future of Cuban culinary enterprise. 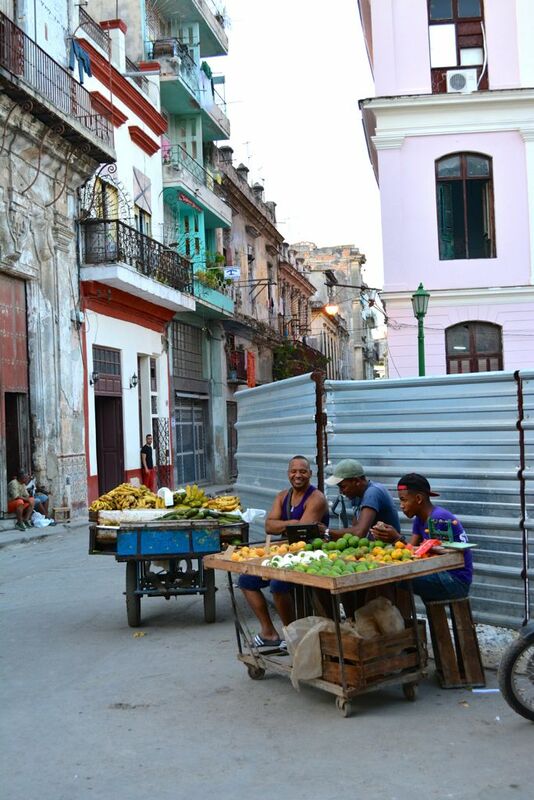 We cannot wait for our next visit to Havana to experience the next step in the evolution of this fascinating country. Thanks for the fascinating and informative account. Witnessing the transition would be very exciting. Hope to do it someday soon.